Home » lifestyle » Jatayu in Kerala, safe as a rock! Jatayu in Kerala, safe as a rock! 10/20/2018 Comments Off on Jatayu in Kerala, safe as a rock! In the epic Ramayana, the mythical bird Jatayu witnessed Sita being kidnapped by the demon king Ravana. When Jatayu tried to stop Ravana, the demon king used Chandrahasa, a weapon he got from the gods, to chop off one of its wings. It is believed that the bird fell on a rock and was alive to narrate the story to Lord Rama who later gave moksha to the dying bird. This is all I knew of Jatayu when our vehicle ascended the rocky hill in Chadayamangalam in Kollam district of Kerala, believed to house the rock on which the injured bird fell. But as I reached the place that has been recently transformed to Jatayu Earth’s Center, a tourist spot of international standards, I learned that Jatayu was much more. The ride in the Swiss-made cable car to the main hill of the four-hill destination gives a breathtaking view of the area surrounded by paddy fields and farmlands. Tucked between the giant rocks is a water body with sparkling green water. “That is our rainwater harvesting system. The pond is 30 feet deep,” said the official who is accompanying us. The water from the pond is used to keep the trees alive in the otherwise dry hills. The cable car ride ends within 10 minutes atop the rock that stands at a height of 1,000 feet and we are led to the giant Jatayu that is vying to take the spot of the biggest bird sculpture in the world. Projected as a symbol of women’s safety and honour, there lies the Jatayu that tries to get up after the fall, with one wing broken and claws curled up in pain, yet putting up a brave face… a face that evokes respect and compassion. “Jatayu symbolises an era when humans and other living beings cared for each other,” says sculptor Rajiv Anchal who is also a film director and art director. “A sculpture should have a message. The message is what attracted me to Jatayu,” he adds. 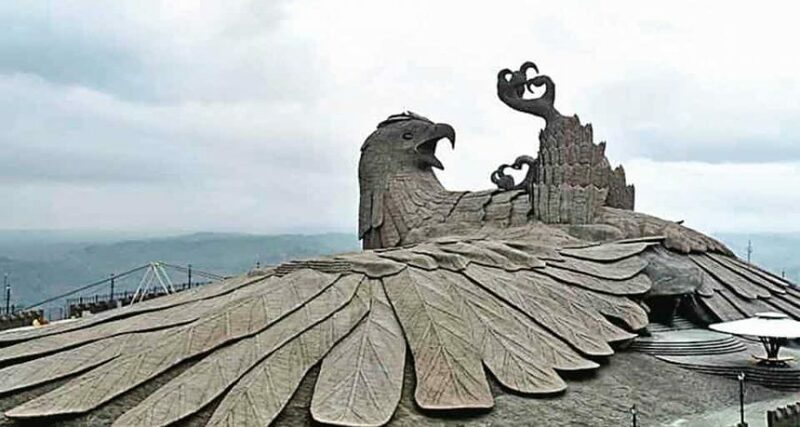 The sprawling sculpture with a length of 200 feet, width of 150 feet and height of 70 feet looks as if the bird is embracing the rock. It has 15,000 square feet of utility space inside, including a multi-dimensional mini theatre, which is yet to be opened to the public. For the daring, a host of adventure activities are available in the Adventure rock hill, adjacent to the Jatayu rock. Rappelling, chimney climbing, log walk and commando net are among them. As our cable car descended the hill, we were informed about the plastic-free zone that advocates responsible tourism, involving families from around the area to produce organic vegetables. From the helipad on an adjacent hill, a helicopter was taking off. “Visitors can avail heli taxi services to other major tourist attractions in the state,” explained the official.